As part of the week of Palestinian culture, yesterday at the Embassy of the State of Palestine, there has been the opening of the exhibition "Embroidering a life in search of the roots". Mrs. Kader, invited by Ambassador Mai Alkaila, took part in the event, followed by a conference on "The role of culture in the Palestinian national identity preservation and presentation of the poetry book" Narcissus signs " written by the author Murad al-Sudani. 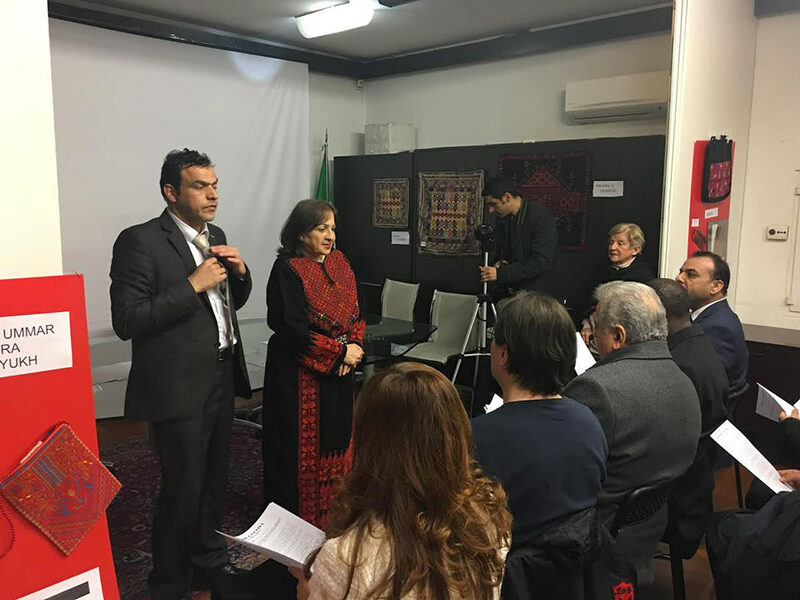 Present at the event, the Italian writers Federation, the publishing house Di Felice and the Palestinian Community in Rome and in the Lazio Region. The Exhibition was ideated by Adele Manzi, one of the founders of the association Najdeh aimed at helping women who survived the massacre of Tel El Zaatar, a Palestinian refugee camp in Beirut, besieged and destroyed during the war in Lebanon.